I’m not upset about it. I’m definitely not kicking and screaming into this birthday; I’m just in a little bit of a disbelief situation. I mentioned to a friend in spin class on Wednesday night that I don’t feel “that old”. It’s just that, as each birthday rolls around (as they tend to do if you’re lucky! ), I think about the oh-so-vivid memory I have of me as a much-younger girl in the late 70’s, doing the math on how old I’d be when it was the year 2000. When my thirty-second birthday arrived, I certainly didn’t feel like the old lady I thought I’d be. I loved my thirties, all of them. They sure did fly by, though! And here it is, even ten years later than THAT. Forty-two. Guess what? I still don’t feel like an old lady. I still feel like I’m in my late twenties or early thirties, and that’s a good thing. I figure that as long as I can keep this good attitude about growing older, I may continue to not feel very old. Over the past few weeks, I’ve been doing a lot of thinking about my big picture personal goals and how I will reach them. I thought that today would be a good day to put them out there in the universe. 1. …want to lose thirty pounds. I will do it by not focusing as much on what to remove from my diet (that’s what I usually do), and rather focus on what I need to add (vitamins, fiber, water, more fruits and vegetables). 2. …want to move (my body) more often. Over the past few years, both the number of classes that I teach AND my personal workouts have dwindled. My goal is to move daily, even if it’s just walking Roxie. I’ve got a great start with Zumba and am now up to a definite four workout days each week; I just need to make sure I’m taking the time to get something in on the other days. 3. …want to get my book published. You knew that. I believe this will happen this year, because I’m going to keep plugging away at it. 4. …want to really get organized. I know most of you think that I am a very organized person, and I guess in some ways I am, but it’s mostly an illusion: my brain is a mess. Is it possible to get your brain organized so it works more efficiently? I’m going to give it a shot. I need to put some systems into place around here so my mind is not always a-jumble. Hopefully at that point, I’ll be able to remember why I called you or what I went into the other room to get. Those are my most important goals for the coming year. As you can see, three out of the four are truly “taking care of me” kind of things. That’s hard for women to do, isn’t it? This year, I’m gonna give it a shot. Happy happy birthday! I love that picture. 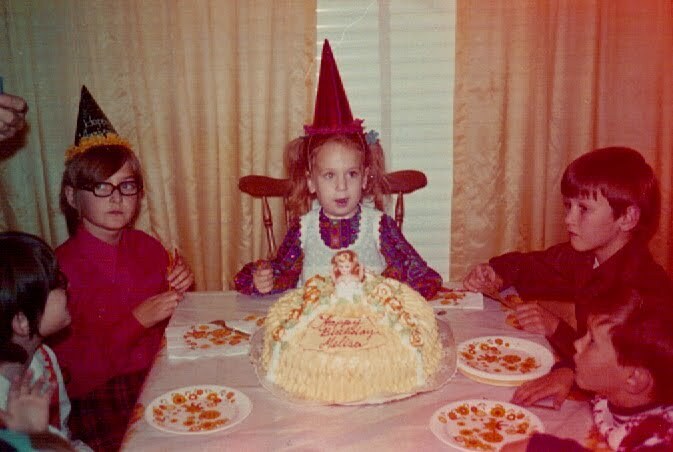 The 70's were a magical time for children's clothing, hair and glasses. You are a rock star. Dipped in awesomesauce. Happy Birthday Melisa! Hope you have a fantastic day! Age ain't nothin' but a number, baby!! Who is this "Me" person of whom you speak? I know her not. Happy, happy birthday! I'm so glad you were born! Happy Birthday! And best of luck with your goals. Happy Brthday! Those are some great goals and I say you will accomplish them! And since I will be celebrating my 5 0 at the (very) end of the year, I'd say you're pretty young still! I hope you reach all your goals, and I definitely believe in your ability to do so. You've made me think a lot about taking care of myself and putting myself more toward the front of the line, I'm glad to hear you doing the same. I for one am grateful that you have graced the world and my life with your presence for yet another year. Happy Birthday (belated) to you! you are now the 6th person i know born on this day. must be a good day to be born. Next post: If The Quality Of A Birthday Is Any Indication Of How The Next Twelve Months Will Go, I’m Gonna Have An Awesome Year. Previous post: While I Work On The Second*, Did You Know There Is A First?